Spring Products Int. is one of the premier US manufacturers of springs. Our Navasota manufacturing facility outside of Houston produces and ships all of our made to order springs. In addition to the traditional wound spring, SPI produces flat springs. We produce our flat springs with the Power Press manufacturing process. In this method, a flat spring is stamped out of various types of sheet or strip metal, including steel and stainless steel. With our state of the art technology the finished product is stamped out to the customer’s specifications every time! For Short Run Production, blanks are produced by Laser or CNC Turrett Presses and then formed to specification. 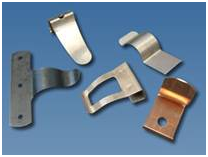 Production parts are made using standard Punching or Progressive Dies. Flat springs are used in everyday items from stovetop knobs to car suspension pieces. For more uses of flat springs and exact specifications, please give us a call. Our staff has years of experience in the spring industry. For knowledgeable answers to your every spring question, Spring Products Int. is just a phone call away at 936-825-6135, toll free 800-515-9773, or email us.